If you haven’t read about Why I Have a Love-Hate Relationship with Math Review Games, then you may want to read through that post real quick! I am very selective about math review games because I think some of the games we use with students can have a negative impact on students’ math esteem even when we play them with the best intentions—to engage students in reviewing important math concepts! If you DID read that post, you know I shared the three considerations I use when selecting or coming up with new math review games, but then I left you hanging at the end of the post without any ideas for review games that I love. Well, here you go! I’ve got several math review games (although they really could be played in other content areas as well) that your students will LOVE! I will update this list as I find or create new review games! Place students in small groups and give each group a set of problems. Give each group of students three things: two notecards that have point values on them that add up to 1,000 and one envelope with a notecard inside with a mystery amount of points. Students solve a set number of problems then raise their hand for the teacher to come check it. If it is correct, one person from their team gets to get up and go exchange one of their cards for another team’s card. They return to their seat and continue the process. The team with the most points at the end of the game time wins! 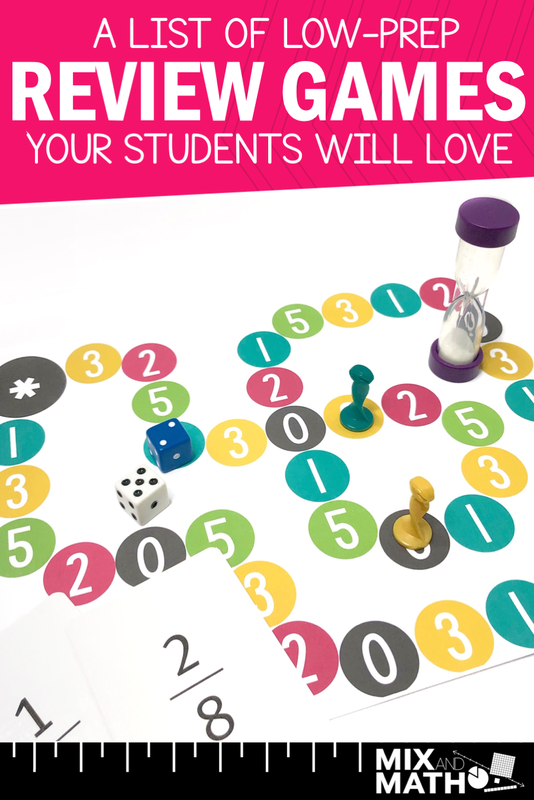 It’s a pretty easy game to play and you can modify/adapt it to meet your classroom and students’ needs! Place students in small groups, assign them a group number, and give each group a set of problems. Students solve a set number of problems then raise their hand for the teacher to come check it. If it is correct, hand the group a sticky note. One person from their team will write their team number on the sticky note, get up and place the sticky note on one of the objects. They return to their seat and continue the process. Once the game is over, reveal how many points each object was worth and have students multiply that point value by the number of sticky notes they had on that object. The team with the most points wins! This game comes from The Comprehensible Classroom and is one of my kids’ FAVORITES! Seriously, I love facilitating this game! So much fun and students’ reactions always make me laugh. Take a second to read how to play The Unfair Game and then check back here for the modifications I made to make it work for my own classroom! One of the ways I modified this game was having two large teams, but breaking students up into smaller teams within those teams. Each small team worked towards the good of their team as a whole. This provided a little more accountability and allowed students to collaborate with one or two other people, instead of half the class. I also just used a simple slide with a table on it and the point values were on a notecard that I revealed when students selected each number (at the time I was very PowerPoint-challenged!). As for the problems, I passed out mini-task cards to each group or I projected the problem and switched back and forth from that and the game slide. This game was shared by MissCalcul8. You’ll notice it has a very similar theme as a couple of the other games I’ve mentioned. You can read how to play this game by checking out this blog post! Of course you will want to modify as needed so it works for your you and your classroom! We always want to be sure all students are working, thinking, and contributing which can be one of the biggest challenges with review games! Hopefully these review games work as well for your students as they did mine, and maybe they might even spark a new review game idea for you! So, what do you think? I’d love to know which review games you’ve played and how it went with your students!